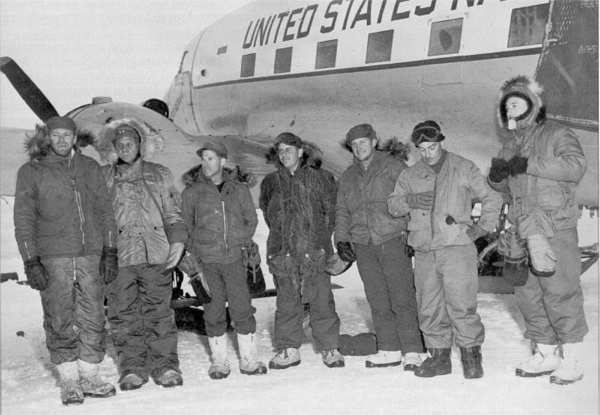 THE LUCKY SEVEN, first Americans to ever set foot on the South Pole to plant the Stars and Stripes beside the cross of Norway and the Union Jack. Left to right, John P. Strider, AD2, crew chief; RADM George J. Dufek. C.O. Task Force 43; LCDR Conrad (Gus) Shinn, pilot; Lieutenant John R. Swadener, navigator; William A. Cumbie, Jr., AT2, radioman; Captain William Hawkes, copilot; and Captain Douglas Cordinor, observer; an all-Navy team for the occasion. 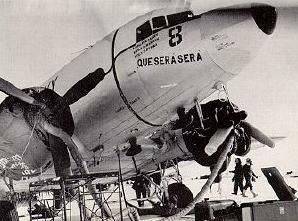 Right, the first plane (a wheeled R4D Skytrain) to set down at the pole. The above US Navy photograph of the flight crew has been published more than once; one version with the above basic caption appeared in the Task Force 43 cruisebook for Deep Freeze II, 1956-57 (the photo at right also appeared in that cruisebook). I've expanded a bit on the names (and checked the spelling) using Paul Siple's book 90° South which lists the first flight crews. I also had a bit of help from 2001 Polie wo Mike Bird. Here's a larger version of the picture (more photos).